Socialist Alternative held its biggest ever National Convention on October 20-22. Over 300 socialists from across the country gathered in Chicago to talk about the crisis of global capitalism, the rising wave of labor struggle, the growing women’s movement, renewed interest in socialist ideas, and the growth of the new left. The National Convention is the highest decision making body in our organization with delegates elected by local branches. It is held every two years to discuss our perspectives for struggle in the next period, where the biggest openings exist for Marxist ideas, and how we can best seize them. At this year’s convention, besides rich discussions about national and international developments, we focused on the tasks facing socialists in the coming period including the critically important campaign to re-elect Socialist Alternative member Kshama Sawant to the Seattle City Council in 2019. As a demonstration of the sheer determination of our members to fight back and contribute to the movement for a better world, our financial appeal raised $125,000! This shows that while the billionaires continue to line their pockets, working people are ready to sacrifice to build a war chest in the fight against the billionaires and bigots like Donald Trump. Our convention was the first held in the era of Trump, whose election two years ago sent shocks throughout American society. Trump’s presidency has deepened political polarization and further undermined the credibility of the institutions of capitalism, including both corporate political parties. Trump’s presidency kicked off with some of largest demonstrations in U.S. history protesting his racism, sexism, and general bigotry. But despite mass protests, the Trump regime has succeeded in getting through two Supreme Court appointees, passing massive tax cuts for the wealthy, and has encouraged a dangerous racial polarization. So far, we have not seen a sustained mass movement centered on the social power of the working class that could truly challenge and defeat Trump and the agenda of the right. Nevertheless his regime, remains highly chaotic. The outcome of the Mueller investigation looms and his highest ranking cabinet members have been embroiled in scandals since day one. The Democratic Party has largely failed to take on Trump’s agenda as was demonstrated by their totally toothless fight to defend the DACA program as well as their approach to the Kavanaugh appointment. The real test for the Trump administration will likely come in the next two years with a renewed economic crisis. With personal debt climbing, the housing and financial markets overheating, and the escalating trade war with China – all signs point to a recession or even a deep downturn that will devastate sections of the U.S. working class. A key focus of our discussion on U.S. perspectives was the labor movement which is finding its feet again after decades of retreat. There were more strikes in 2018 than any year since 2000 which points toward the revival of the strike weapon. Central to this was the teachers revolt, beginning in West Virginia, which is still not over given that L.A. teachers, for example, may go on strike in the coming weeks. But this upsurge is not just about teachers. This summer and fall there were high-profile strikes at Marriott hotels across the country. UPS workers voted against a sellout contract but it was forced through by the Teamster leadership based on a technicality. As delegates pointed out, tech workers and logistics workers are also being radicalized. The strike at McDonald’s against sexual harassment also points the way forward. The teachers strikes demonstrated that winning requires a new leadership in the labor movement. Rank and file Facebook pages and organizing committees were formed outside the union leadership’s control in several states. Despite the leadership’s pleas to end the strike, the West Virginia teachers refused to return to class until their gains were signed and sealed. They have now created a new rank and file caucus. Socialists have a key role to play in helping lay the basis for a new, militant labor leadership that can reclaim existing organizations, build new ones, and lead struggles to victory in the coming period. Another key theme of the convention was the growing women’s movement which is a hugely important feature of U.S. politics right now. The appointment of Brett Kavanaugh to the Supreme Court led to a massive new development of #MeToo with huge numbers of people sickened that a predator could be elevated to sit on the highest court in the U.S. Millions of women are fed up with sexism and harassment and are looking for the most effective way to fight back and win. Many are understandably gravitating toward the midterm elections as the way to strike a blow against the largely male establishment. However a key section of young women are not satisfied with simply having more female politicians or CEOs. For many, it is critical that the fight against sexism take the form of a fight against low wages, unaffordable childcare, Medicare for All, and rent control. 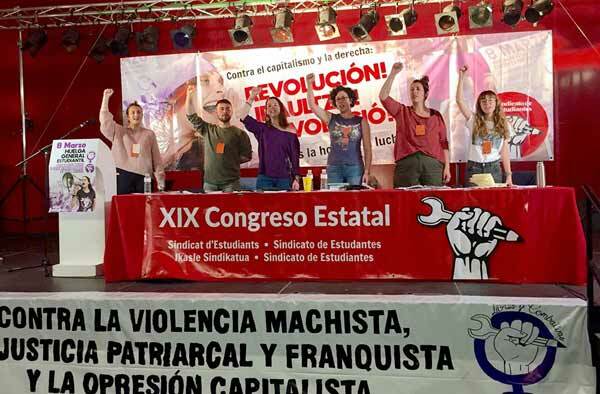 At our convention we discussed the crucial opening for socialists to build a working-class oriented wing of the women’s movement based on the ideas of socialist feminism. The convention also pointed to the importance of LGBTQ struggles in the coming period. The convention discussed possible outcomes of the 2018 midterm elections where the Democrats will make gains at state level and in the House of Representatives including possibly taking control of the House. This will likely boost the confidence of millions of people who are fearful of what the Republican agenda means if it continues unchallenged for two more years. However there are real limits to the “blue wave” and the key question for Democrats, including progressives, will be what they do after the elections. Within this, we discussed and rigorously debated what is represented by the campaigns of self-described socialists like Alexandria Ocasio-Cortez and Julia Salazar. The convention reaffirmed the approach we have taken of welcoming and engaging with these developments as we did Bernie Sanders’ campaign in 2016 while pointing out the serious limitations of working within the framework of the corporate dominated Democratic Party. Sanders’ failure to continue his campaign in 2016 after the rigged Democratic primary and the failure to turn Our Revolution into a real membership organization organizing in the streets and at the ballot box undermined the “political revolution against the billionaire class.” Instead, many young Bernie activists went toward the Democratic Socialists of America (DSA) which has grown to over 50,000 members. There is an ongoing debate within this new left about how to build a political force that represents the interests of working people and the oppressed and how this relates to the Democratic Party. We feel that in order to win the bold pro-working-class demands of Sanders and Ocasio-Cortez and other elected self-described socialists it will be necessary to form a new political party outside the two-party system that has the participation of millions of working-class Americans and that roots itself in social movements. Events in the next period point to a deepening conflict between large sections of the base of the Democratic Party and the establishment which will be a key part of this process. In 2019, Socialist Alternative will face our biggest battle yet: the fight to re-elect Kshama Sawant to the Seattle City Council. Kshama was first elected in 2013. Her position in Seattle has been a critical tool for working-class Seattleites to win victories like the first $15 an hour minimum wage in the country, winning millions of dollars for social services, and the building of new affordable housing. Kshama has become a beacon in the fight for independent left politics in the U.S. We played a key role in the campaign this spring to tax the largest corporations in Seattle to fund affordable housing, dubbed the Tax Amazon campaign. This campaign struck fear into the hearts of Jeff Bezos and other representatives of the billionaire class. With the aid of treacherous Democrats, they forced the repeal of this tax shortly after it was passed. It is certain that in 2019 the corporate elite will be determined to fight us with everything they have. Winning this re-election campaign will require tremendous resources from working-class people in Seattle and across the country. This campaign can be a megaphone for the struggles of working people generally and will direct people’s energy against Seattle’s wealthiest tycoons as well as the political establishment determined to defeat us. The convention laid great emphasis on the need for our organization to root itself in the developing struggles of the working class. Our members are playing critical roles in several local unions including the Amalgamated Transit Union in Minnesota and a number of local nurses unions. We hope to deepen our ongoing work in these unions as well as build on this by encouraging our members to get jobs in radicalizing workforces like education, health care, and logistics. Socialist Alternative is clear that in 2019, as in 2018, we can see social struggle break out on a range of issues from defense of trans people, to fighting racism to defense of the environment. But given recent developments, we are laying particular stress on the necessity to build a socialist-feminist cutting edge within the broader emerging women’s movement in the U.S. That means fighting unapologetically for the needs of working-class women, black women, trans women, and all those who struggle with low wages, insecure housing, and poor health care. We are not satisfied with simply electing more women into office or seeing more women CEOs. We believe the women’s movement needs to speak to the needs of the vast majority of women. Women who are paid poverty wages, are drowning in student debt, are left with inadequate health care coverage, and are stuck in abusive relationships for fear of not having a place to sleep. We hope to work with the DSA and other forces to build the forces of socialist-feminism. There are tremendous opportunities to build the forces of revolutionary socialism going into 2019 and if our National Convention is any indication, Socialist Alternative is prepared to enthusiastically seize these opportunities!